Recipe Now is an iPhone app the delivers recipes from various recipe websites and blogs around the web including SeriousEats.com and presents them in an iPhone interface. While you can easily visit these recipe blogs and websites from the Safari browser for free, with this 99c application you get a simpler cleaner interface. The first time you load the Recipe Now app you need to hit the refresh button so it will start to fetch the feed of the latest feeds and takes a few seconds to load them up. The UI is not very fluid however and feels a bit clunky at times. You can Search for recipes by keyword. This feature only searches the title of the recipes however and doesn’t look at the ingredients. Viewing a recipe article show its image(s) and ingredients, and procedures. There is a way to bookmark a recipe page by tapping the maker icon on top of the page which saves the recipe for later use. Once you read a recipe it gets moved to a viewed section. The app works while you are offline which is a plus in case you lose network connection while shopping for ingredients at the store. Saving recipes for ever, since the most you can keep something is for 3 months. No way to pick and choose what websites the recipes are being fetched from. 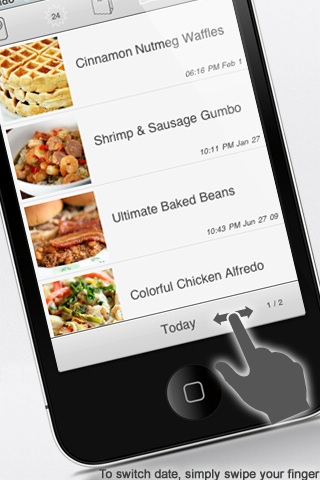 Overall, Recipe Now is a plain and simple app for surfing around for random recipe ideas from various online blogs. It costs one dollar and has inline iAds which is annoying for a paid app. You can find better recipe apps in the App Store. AppSafari review of Recipe Now was written by Joe Seifi on November 6th, 2007 and categorized under App Store, Food. Page viewed 4201 times, 2 so far today. Need help on using these apps? Please read the Help Page.